Faithfulness isn’t an ear mark of this world. Our society is often a display of a lack of commitment, follow-through and corruption. We see the opposite of faithfulness in the public through people through their financial dealings such as tax evasion, embezzlement and the like. We also see it through the sometimes unfaithful and corrupt behavior of some politicians and other officials as well. This is especially true when we see these supposed leaders seeking to tear down others and attempt to malign the character of others. We see it in the lives of famous people or everyday people too, as they sometimes aren’t faithful to their wife or husband. We see it in some people with a lack of work ethic. We see it with the lack of follow-through as often people don't do what they say they will do. We see it in friendships where someone betrays the trust of others. Like someone shared something confidential with them or they say they promise to keep it a secret and then when it comes down to it, they don’t keep it a secret. Or how about when someone propagates gossip about someone? None of the above are what faithfulness is. Or some dictionaries and commentaries refer to it as reliable, steadfast and unwavering. 2- As a gift of the Holy Spirit. 3- As a positive attribute or characteristic that some have. 4- As an attribute or characteristic that many lack. In Practical terms, faithfulness is marked by things such as loyalty, trustworthiness, reliability, commitment, following through, being a man or woman of your word, perseverance, being a good steward with what God has entrusted you with or others have. Biblical faith is grounded in a belief that God is who He tells us He. It's also a trust in what His Word says over anything this world tells us and knowing He promises to work everything together for good. We put our Faith in God and He then grows faithfulness in us. 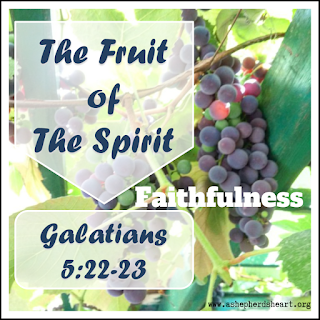 I’ve heard it well said that faithfulness is the "gluing" fruit that will preserve our faith and the other fruit of the Spirit and identify God's will so we can be dependable and trusting to God and others. Because if you’re not faithful – the rest of the fruit of the spirit cannot grow as well in you. 2 Thessalonians 3:3 - But the Lord is faithful. He will establish you and guard you against the evil one. John 14:16 - And I will ask the Father, and he will give you another Helper, to be with you forever. John 14:26 - But the Helper, the Holy Spirit, whom the Father will send in my name, he will teach you all things and bring to your remembrance all that I have said to you. Act 1:8 He promises that the Holy Spirit will come to empower us so we can be His Witnesses…then on The Day of Pentecost – Acts 2 the Holy Spirit was given. He’s faithful to provide the help we need so we can live out our faith and live a faithful life! Because God is trustworthy with us we can be faith-worthy in Him! For you and I, faithfulness begins when we put our faith in Jesus Christ. Walking with Christ is a daily exercise in faith and faithfulness because you are to be committed to who God says He is from cover to cover in His Word. We walk by faith not sight: 2 Corinthians 5:6-7 So we are always of good courage. We know that while we are at home in the body we are away from the Lord, for we walk by faith, not by sight. Through every experience in life, no matter what your eyes see or tell you…you walk by faith and not by sight. Furthermore, your life should be driven and motivated by what God says and not by what your eyes see as if you only follow the world…your vision will grow very blurry very quickly. Be faithful to honor God by rightly studying, representing, interpreting and communicating His Word! Read the “Hall of Faith” in Hebrews 11:1-12 as each of these examples are people God highlights as examples of faith. As you read it, you'll not He doesn’t mention any of the failures of faith in their lives, rather, He focuses only on the victories. Noah for example displayed the gift of faithfulness as he lived in a place that didn’t see rain and for 120 years built the ark and warned people of the pending judgment. He remained faithful. Sarah was in her 90s when God allowed her to be able to conceive. As you read the entire chapter you’ll see examples of people who for one reason or another didn’t get to see God fulfill the promises He’d given them but they remained faithful and God recognized their faithfulness. "Our heavenly Father is a very experienced One. He knows very well that His children wake up with a good appetite every morning … He sustained 3 million Israelite's in the wilderness for 40 years. We do not expect He will send 3 million missionaries to China; but if He did, He would have ample means to sustain them all … Depend on it, God’s work done in God’s way will never lack God’s supply." I recommend that you start by asking the Holy Spirit for help in growing in faithfulness. Practice being faithful and one of the practical ways you can do so is by keeping your commitments. You also have to be the one who purposes to walk in faith and not by sight. You have to put the faith in the faithfulness. Put your faith into action and keep your eyes fixed on Jesus and not on this world. Ultimately, it's vital be faithful in the little things and as Luke 16:10 says: “One who is faithful in a very little is also faithful in much, and one who is dishonest in a very little is also dishonest in much. 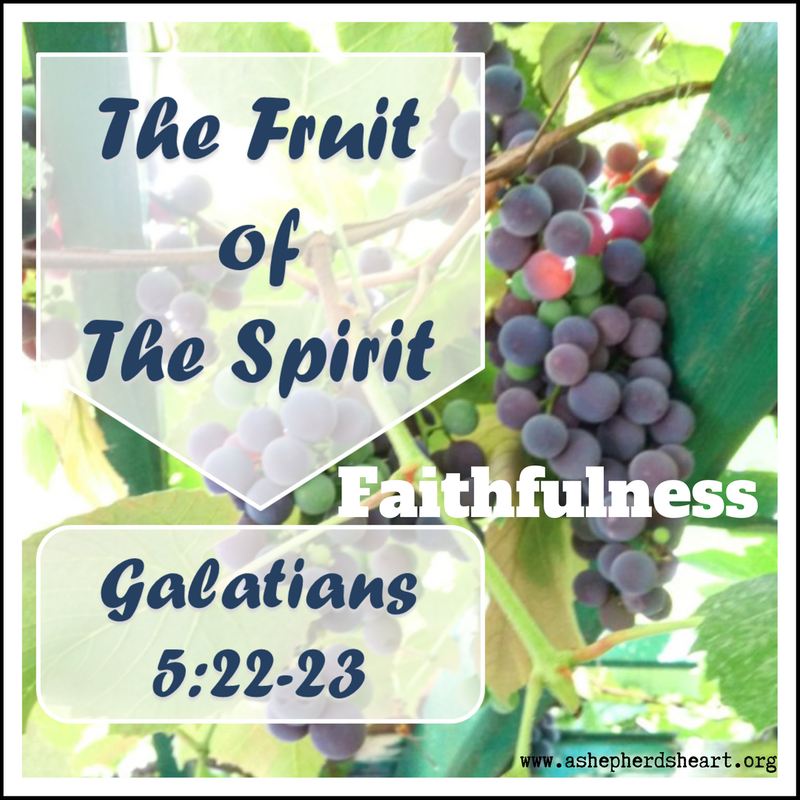 As followers of Christ, Faithfulness should be one of the ear marks of our lives as God through His Holy Spirit continues to help us grow in this Fruit of The Spirit. Let's pray for one another that God will help us continue to grow in The Fruit of The Spirit of Faithfulness and that we'll strive to be faithful in all we do for His Kingdom and Glory.